Sauce: In non-stick pan, sauté shallot in olive oil until translucent, about 3 minutes. Stir in jalapeno, Wild Blueberries, balsamic vinegar, orange and lemon juice. Let simmer while stirring for about 3 minutes. Turn up heat and reduce until liquid reaches a syrup-like consistency. Toasts: Lightly toast slices of bread. 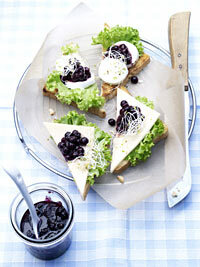 Spread toasts with butter as desired, cover with lettuce leaf and cheese. Add a dollop of Wild Blueberry sauce and garnish with sprouts. Preparation time: approximately 20 minutes. Serves 4.